Through the Cyber, branches as well as an e-commerce or booking engine can be added. With the mobile app, a company overview, brands that your company deals with, payment methods can be integrated in your business listing. On top of this, your mobile app listing will be available offline. The number of sub categories are more extensive than any other package and all the other features are Unlimited. The user of this package will not be limited in any way but will be able to take full advantages of all the features of the packages of MYP. 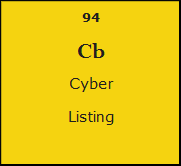 Under the Cyber your company can be listed under 1 main category, 6 subcategories with Unlimited keywords and unlimited sub sub categories with unlimited keywords. The cyber is considered to be the ultimate package, it entails services that none of our competitors offer in a single plan. Using the cyber will open the doors of innovation and it keeps tab on our future developments that we will carry in the near future.